Two performances of "I Have a Dream" will be presented on Friday, Feb. 1, as part of the 2018-19 Children's Performing Arts Series at SFA. NACOGDOCHES, Texas - The Children's Performing Arts Series at Stephen F. Austin State University will present two performances of the uplifting "I Have a Dream" on Friday, Feb. 1, in W.M. Turner Auditorium on the SFA campus. Coming to SFA just in time to observe February as Black History Month, this compelling dramatization of the life and times of one of the most influential and charismatic leaders of the "American Century" and the Civil Rights movement will inspire students as they experience Dr. Martin Luther King Jr.'s struggle and his dream of lifting "our nation from the quicksand of racial injustice to the solid rock of brotherhood." "The play traces Dr. King's life from his humble beginnings in Atlanta, Georgia, through his extraordinary evolution into one of the 20th century's foremost figures," according to Diane Peterson, SFA Fine Arts Box Office manager and director of the children's series. "Students will learn about Dr. King's philosophy of nonviolence and the methods he used to bring about social change." Presented by Virginia Repertory Theatre and written by Bruce Craig Miller, "I Have a Dream" targets children in second through eighth grade. Performances are at 9:30 a.m. and 12:30 p.m. in Turner Auditorium, which is located in the Griffith Fine Arts Building. Tickets are $7.50 for individuals and $6 per person for groups of 20 or more. Presented by the SFA College of Fine Arts, the Children's Performing Arts Series annually features five shows designed to entertain, educate and engage young audiences of all ages, according to Peterson. Study guides provide suggestions for pre- and post¬ performance activities and discussions for teachers to use in the classroom. 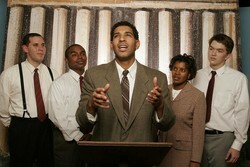 A comprehensive study guide for "I Have a Dream" may be accessed at cpas.sfasu.edu. Other upcoming CPAS performances include "Madeline and the Bad Hat" on Wednesday, March 6; and "The Jungle Book" on Thursday, May 16. To order tickets, call (936) 468-6407 or (888) 240-ARTS. Visit the CPAS website at cpas.sfasu.edu for additional information.